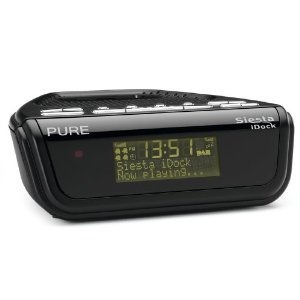 The Siesta is a high quality DAB/FM clock radio with a built in iPod docking station, and a USB socket, which can be used to charge another device such as a phone. Construction is light but reassuring, and the clock is well finished. The triangular design looks pleasing. Displayed digits are not large, but legible, and the night-time luminosity level is adequate without being obtrusive. DAB signals are strong in my area, whereas FM is weak, which is the primary reason why I looked for a DAB clock radio to replace my ageing Audioline TimeTrak RTT1, which has FM/LW only but has clock synchronisation from the very accurate MSF radio signal. The clock time is automatically set by the DAB radio signals, though there is a manual setting procedure, and whilst it’s not anything like the accuracy of dedicated atomic clock radio signal synchronisation, it’s more than adequate for domestic or civil time use. My clock started with an error of around two minutes against a known GMT source (my TimeTrak RTT1), but over the course of a day or so, this came down to within a few seconds of the BBC broadcast time signal pips. There are those who have reported significant drift if the radio is left off for some time. I’ve not experienced this. Although I’ve not tested it, it did occur to me that one of the four alarms could be set to switch on the radio for an hour at zero volume during the night, with a sleep time of about an hour, to let the clock resynchronise with the DAB time. Station presets are set and accessed, not by dedicated buttons, but by pressing on the `Preset’ button, which shows preset station #1, then cycling through the other preset numbers with the +/- keys. In practice, this works well, particularly if, like me, you only have a few stations you regularly tune to. It is less awkward than I had expected. Whilst the maximum volume won’t rattle any windows, it’s easily adequate for an average sized room, and the sound quality is good, with absence of distortion and `tinny-ness’ even at highest volume settings. There are four independent alarms, each with its own set/cancel button. Each alarm can be set to come on every day, or just weekends, just weekdays, or a dated day. The alarm can be either a tone alarm, or a radio source, or the docked iPod. When setting the radio alarms, you can set the station to wake to, which can be but doesn’t have to be the last station listened to, and you set the volume. A little oddly, you don’t hear a sample volume as you move up or down the volume indicator bars, but it’s easy enough to get familiar with the settings, and once a volume has been set, you generally don’t meddle with it again. A little surprisingly, when the radio comes on as an alarm, the volume cannot be adjusted ; it remains at the volume level set when the alarm itself was set. If you want to adjust the volume, you must cancel the alarm and turn the radio back on. This is not particularly problematic, as it only takes two button taps, but it is something you should be aware of lest you think there’s a fault. Tapping briefly on one of the alarm buttons will turn it on or off, and a corresponding number will show/clear on the front panel, but oddly, does not display what the alarm time is. For that, you must go through the alarm set procedure. It would have been a nice design touch had a tap given a temporary confirmation show of the set time for a second or two. It would also have been useful had the designers allowed for some illumination of the alarm buttons, since they’re not visible at all in the dark. I get round this by having a table lamp on a timer, though I’ve always had this anyway. Cunningly, when the alarm triggers, the sound starts very low then builds up to the set volume over several seconds, so that the alarm never jars even on very early morning calls. This is true regardless of which sound source is chosen. This gentle rising volume does sometimes result, for me at any rate, in becoming `acclimatised’ to the sound of the radio, and forgetting that it really is a wake up call. I have therefore set alarm number 4 as a beeper alarm timed for my deadline alarm time. The beeper alarm cuts off any radio play alarm in progress. The iPod docking point and the USB socket have proved useful. I now charge my iPod Touch and my Blackberry on the Siesta, which not only frees up USB sockets on the computer or laptops, it means I always know where they are. Be aware that there is no battery backup for the Siesta. If there is a brief power outage the clock will recover and resynchronise, but if the outage lasts beyond your alarm time, the clock is off and will not sound any warning at all. If this is critical for you, you need either a little `failsafe’ alarm clock, or a radio alarm that does have a battery backup. The Siesta is an exceptionally good clock radio. It wakes me up gently in the morning, and it has a very good sound quality. The radio can be set to switch off after a set time, which is a useful feature for night-time listening. Taking into account the minor niggles, like the absence of illumination for the alarm buttons or the lack of battery backup, the obvious question is, would I buy one again? The answer is a decided yes. The Siesta clock radio merits an unhesitating recommendation.